Here is a recent update from Four Seasons at Indian Lakes. We welcome your reactions and feedback to this news on this blog and on our Facebook page. Earlier this year we unveiled a concept for an active lifestyle, resort-at-home community, Four Seasons at Indian Lakes. We reviewed the preliminary plan with neighbors, received thoughtful feedback and made refinements. We’re now ready to begin discussions with the Village. Over the few past months we have been finalizing the substantial documentation and diligence required to support a project of this complexity. A new road connection is proposed for neighbors on Cardinal Drive to provide them access to the traffic signal at the hotel entrance to turn on Schick Road. The public walking path system and landscaping in the 70 acres of open space have been reworked to ensure every neighbor has a sufficient buffer. The layout of the neighborhoods in the Four Seasons community were adjusted to better transition and align with the existing homes and lot sizes that border the property, creating improved consistency for backyards and open space. Hotel officials have secured the financing necessary to complete the over $5 million-dollar transformation of the hotel into a DoubleTree. Work on the hotel will commence this fall. During the next few weeks, there may be engineers, surveyors and other workers on the property completing their final work. No plans have been submitted to the Village yet and no approval has been given. Ask a question or submit a comment to us through the Contact Us section of our website or by emailing us at newindianlakes@gmail.com. We will be in touch again shortly. Copyright © 2017 Four Seasons at Indian Lakes, All rights reserved. 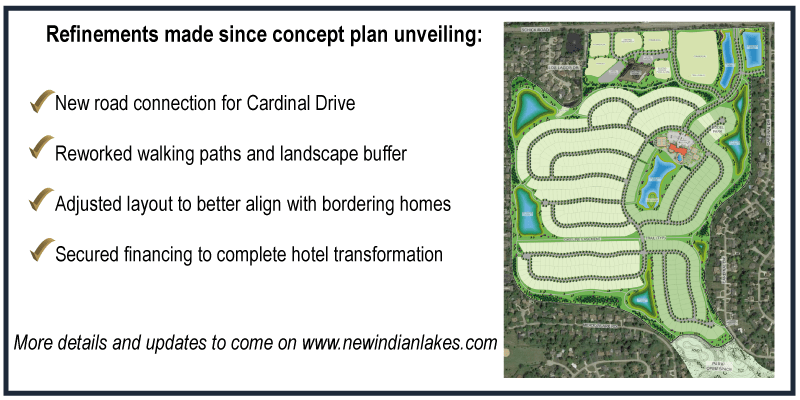 You are receiving this email because you asked to receive updates about the proposed Four Seasons at Indian Lakes at community meeting or www.newindianlakes.com.